Disney cruisers fall into two major categories: families who do it for their kids and adults who do it for themselves. The former take their daughters to Frozen Parties or treat them to princess makeovers at the Bibbidi Bobbidi Boutique and then escape to the adults-only areas on the third, ninth and tenth floors. The latter board wearing customized t-shirts chronicling every Disney voyage and adorn their cabin doors with magnets and paper signs you’d find in a college dormitory. Construction on the Disney Wonder began in 1997, and the vessel made its maiden voyage two years later. She has a bad reputation among the Disney liners—a missing crew member in 2011, a nasty norovirus outbreak in May. The Wonder is slated for renovation in September, when she’ll travel to Spain and get gutted. Until then, the vessel remains spectacularly ‘90s. Restaurants like Animator’s Palate and stage shows like “The Golden Mickeys” celebrate films that many passengers grew up with—contemporaries in the era of the ship’s birth. 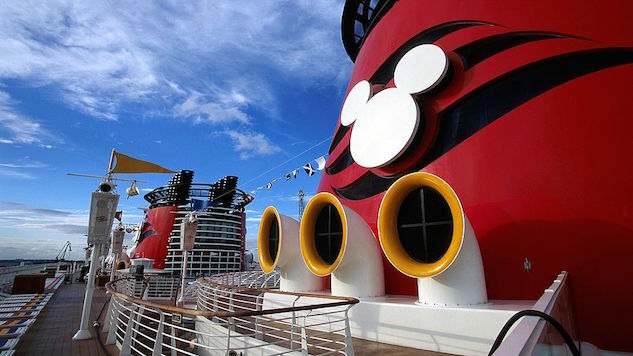 The Disney Wonder isn’t nostalgic because it doesn’t look back. It’s still there. Southwest Alaska is an isolated collection of islands and peninsulas. No roads lead out of Juneau. A handful of one-lane highways stretch fewer than 50 miles until they reach a yellow sign that reads “END.” If you’re going to see this coast, you’re going by boat. Hence the cruise ships and the contemporary Southwest Alaskan economy: the once prolific lumber industry dissipated in the late 1990s with a congressional movement to protect the area’s temperate rainforest, and the coastal towns turned from timber to tourism. You can still see the remains from the loggers’ golden age. Ketchikan and Skagway, major stops on the Alaskan leg, shrink in the off-season as souvenir shops and jewelers selling tanzanite migrate south. In the summer, merchants and guides work twice as hard. In the Endicott Arm, fresh and saltwater meet and turn a brilliant turquoise. Ferns, moss and seaweed cling to cliffs and cracks peppered with waterfalls. Mist lingers over every surface. On Allen Marine Tours’ “once in a lifetime” excursion to the Dawes Glacier, people silently fight over seats and sedate their contempt with spiked coffee. Spectators applaud as a massive chunk of the glacial ice snaps and shatters. The new iceberg reverberates as a massive wave and the catamaran wobbles. Dawes won’t survive this lifetime. Passengers hoot while you realize you’ve paid to watch the end of the world. Then you turn around and see the ship … you could have done this for free. Passengers seem shocked to discover that a corporation as prominent as Disney keeps snatching dollars onboard. The marketed internet packages drain data and rack up credit card charges; a thousand megabytes can disappear in as few as two days. A single bottle of water starts at $2.50. Pick the wrong port adventure and you’ll be swindled. Not all the excursions are as blatant a rip-off as the Dawes Glacier Adventure. Skagway’s Sockeye Cycle Co. takes small groups on a leisurely biking and walking tour through the remains of Dyea, a sporadic mining town from the end of the 19th century. Here, the air is at its purest, filtered by a lichen shag carpet. The Tongass National Forest swallows much of the terrain. It’s the largest temperate rainforest in the world, a cluster of Sitka spruce and western hemlock trees. Late summer brings an Augustine explosion of mushrooms. The excursion closes with a detour to a nearby coastal plain decorated with dollops of fog. The only downside is that the guides don’t give you proper time to gawk at the scenery. Juneau-based Gastineau Guiding’s Alaska Whales & Science Adventure begins with a hike to Mendenhall Lake, which abuts an identically named glacier. Children are encouraged to become scientists for the day and given tasks as they trot through the Tongass and study spawning salmon. A black bear and her three cubs dart in front of my tour group on their way to the water. Then, a shuttle ride to a harbor so people can chase whales with small boats and telephoto lenses. In Ketchikan, Taquan Air steers a group of bush planes over the Misty Fjords. A fjord is a glacially carved expanse filled with seawater,” the pilot tells us again and again. The aircraft turns. We press our heads to the windows and take in the fjord from above. He lands on the water to let us stand on a platform and marvel. The Wonder’s final dinner closes with a show applauding the collective restaurant staff and its diversity, a parade of flags set to the most annoying Disney tune of all time. Costumed celebrities return for a final photo op, sparking a wave of hugs and tiny smiles. The mainland, Vancouver, is finally in reach. The week is over, the Disney is done. We disembark with a newfound patience and the words to songs we thought we’d forgotten.